Robert Day Carter was born in Chicago, Illinois, on January 2, 1875, according to the Cook County, Illinois, Birth Certificates Index at Ancestry.com. His parents were Consider B. Carter and Emma Marsh. In the 1880 U.S. Federal Census, he was the youngest of five sons. His father was a contractor and builder. They lived in Chicago at 314 West Jackson Street. information regarding his art training has not been found. The New York Times, March 1, 1918, said he began his newspaper career with the Chicago Inter Ocean. The 1897 Chicago City Directory listed Carter as an artist who resided at 2347 Michigan Avenue. Newspaper artist Carter moved to New York City in the late 1890s. In the 1900 census, his birth was recorded as February 1875. He had married Hilda, around 1898, who emigrated from Austria in 1896. They had a son, Robert D., who was born in New York, February 1899. Carter’s father lived with them at 95 Hart Street in Brooklyn. Carter produced three strips in 1903: Coffee and Sinkers, Just Little Ones, and Montgomery and Professor Gassem. In the 1910 census, Carter had remarried to Lilian who was born in California. The family included a nine-year-old daughter, Mary. They lived at 566 Greene Avenue in Brooklyn, six blocks south of their previous residence. Carter was a newspaper artist. 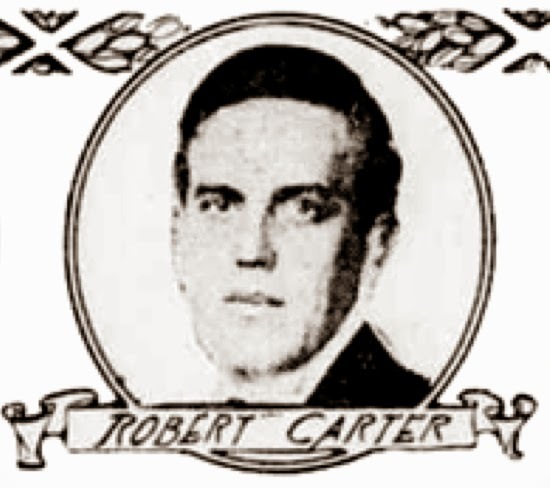 Carter was the subject of a tribute in The Outlook, August 23, 1916. The article was reprinted in Cartoons Magazine, November 1916. The editors of The Outlook have a decided grudge against Mr. Robert Carter, of the New York “Evening Sun.” It is a grudge founded on the inescapable fact that he adds considerably to our editorial labors. Once a week it is our task to choose from the work of newspaper artists a group of cartoons typifying the development of public opinion throughout the country. Clippings from all over the United States are piled upon our library table, and a large and empty waste-basket placed conveniently at hand. Then the work of selection begins. Cartoons with good ideas badly executed, cartoons with poor ideas respectably executed, and cartoons which in both thought and craftsmanship are deserving of summary execution rapidly pass the way of all flesh. When the basket is filled to overflowing, upon the table there remains perhaps a scant dozen of cartoons from which a final choice must be made. And this is where the intrusive Mr. Carter generally breaks in upon our editorial calm. It has happened more than once that when the chaff has been taken away the bulk of the remaining wheat is found to be inscribed with the name of Mr. Robert Carter. In righteous indignation we ask Mr. Carter, How can conscientious editors provide a variety of cartoons for their readers when one cartoonist insists upon monopolizing most of the good drawings? We insistently wish to call Mr. Carter's offense to the attention of the Inter-State Commerce Commission, or any other public service body with the power and the will to act against the activities of this apparently unrepentant monopolist. Even if we cannot forgive Mr. Carter his annoyingly .frequent successes, we are broad-minded enough to express openly our debt to him for what is, perhaps, his best contribution to the record of American cartoon history. We like, without qualification, his presentation of Uncle Sam. Mr. Carter’s Uncle Sam is not a pen-and-ink abstraction. He is the visible embodiment of an ideal. Lincolnian in stature and countenance, austere of thought and speech, courageous of heart and mind, strong enough to be tender, wise enough both to dream and to act, Mr. Carter’s image of our national spirit looms like a mountain-peak among the conventional visualizations of the American nation. The Uncle Sam of Mr. Carter’s creation is a citizen of the world, with world-wide sympathy and understanding. Yet in the transition which he has undergone from the rustic Brother Jonathan of half a century ago he has not lost the true tang of Americanism, the shrewd humor born of the open spaces of an undeveloped continent, nor the vision and the outlook of the eternal pioneer. We want more of Mr. Carter’s Uncle Sam, not only in the pages of the “Evening Sun,” but in the halls of congress and in the executive chambers of our government. Several of Carter’s cartoons for the New York Evening Sun are here, here, here, here, and here. Some time in 1917, Carter moved to Philadelphia and drew for the Philadelphia Press. Three of his cartoons for the Press are here. Robert Carter, a well-known Philadelphia cartoonist, died suddenly early yesterday morning at the Samaritan Hospital. He was 44 years old and is survived by two children, Robert, 19 years old, and Mary, 17 years old, and a brother in Chicago. Mr. Carter was cartoonist for the Philadelphia Press, in which his last cartoon appeared yesterday. It had been drawn the day before, when he appeared to be as well as usual except for a slight headache. At 10:30 P.M. he was taken suddenly ill and later removed to the hospital. He died at 3 A.M. yesterday. 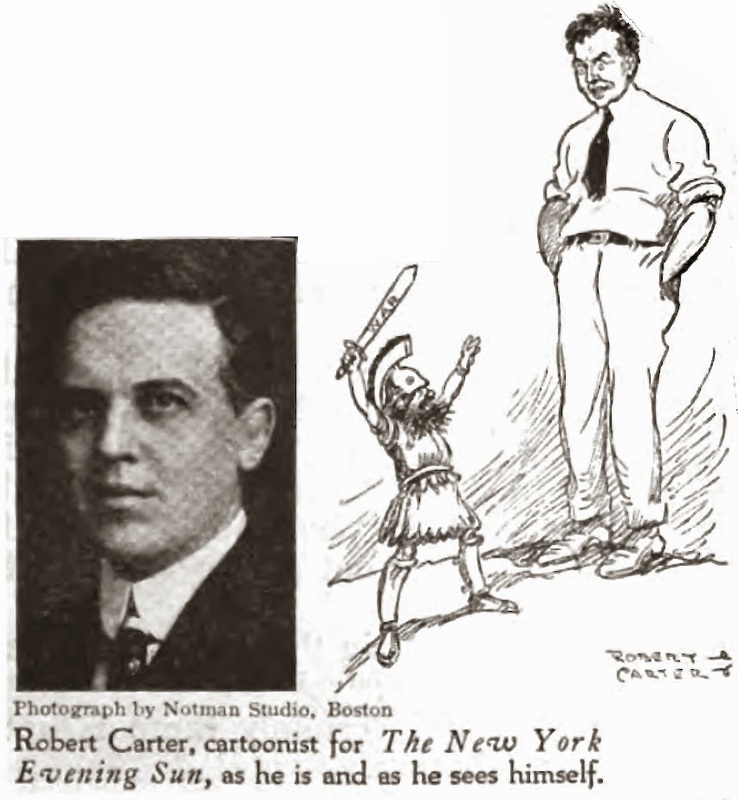 Mr. Carter began newspaper cartooning in Chicago, from which city he went to New York, working on two papers there. He joined the staff of the Philadelphia Press about a year ago, and done much to promote the Liberty Loan drives. The New York Times said he had been employed by papers in New York, Chicago, Boston and Philadelphia. If I were a betting man, the symptoms and sudden death might indicate a stroke, however, the mentioning he suddenly took ill, leads me to speculate that it was the infamous Spanish Influenza that killed him (which was starting at that time, and had the tendency to kill quickly the who would normally be the healthiest members of the population (16-50).